Do you need Malaga airport information? 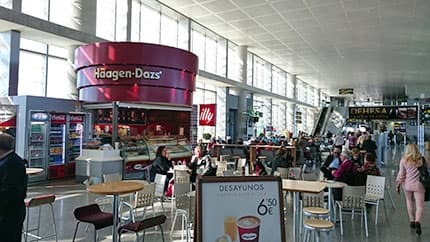 It became known as Malaga Airport - Costa del Sol from mid-2011, and is considered the most important airport in Andalusia as it receives a high percentage in relation to incoming and outgoing international flights. 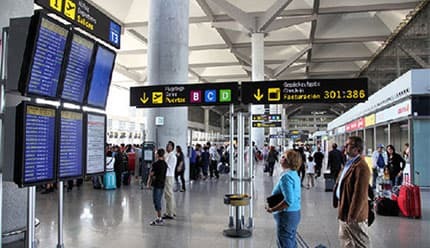 Nationwide statistics place it as the fourth largest airport in terms of passenger numbers, with almost thirteen million and surpassed only by the airports of Madrid, Barcelona and Mallorca. 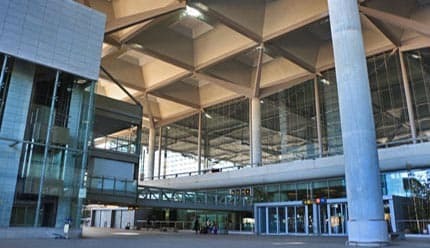 The operator of Malaga Airport-Costa del Sol is Aena and its IATA flight code is: AGP.The beginnings of the aerodrome date back to 1919 and its location has always been in the vicinity of Churriana just eight kilometres from the city of Malaga. Formerly the airport had only one terminal, which since the 60's was remodelled as the tourist boom was already a reality and required more space and infrastructure. 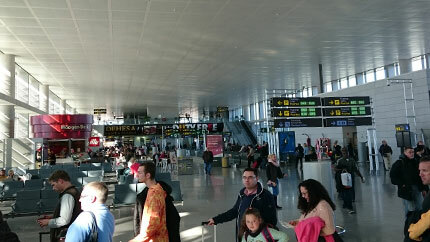 In the early 90's opened the second terminal T2, called Pablo Ruiz Picasso terminal; as the original terminal became far too small and there was an urgent need to build a new terminal, due to the increase in passengers and flights. In 2010 was created the current T3, which completely resized and restructured arrivals and departures of flights at the airport of Malaga; this new milestone contributed more than double passenger capacity per year. The last Terminal is outstanding with its impressive design; from the outside it is visible as a large construction and inside the impression is similar where it is exceptional for its illumination; actually, the airport has established itself with a modern and adequate design. 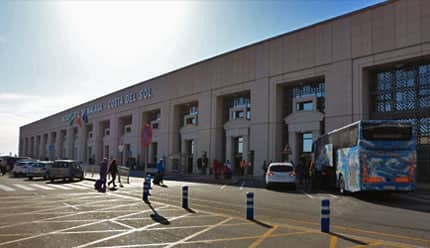 The desire of many professionals working in the airport Malaga - Costa del Sol will be served from June 2012, with the new, second runway in operation; something that although not considered strictly necessary, will greatly help flight traffic and can comfortably accommodate more than 30 million passengers annually. Following you can find out the arrivals and departures at all times. The panel automatically displays arrivals, click the departures button inside the panel if you need to see that information. Shops: Museum Shop, Ferrari, Adolfo Dominguez, Adidas, Lacoste, Toro Andaluz, Librería Luces, Superskunk, Travel Mate, Choco & Lates, Desire, The Sweet Market. Restaurants: Vips, Pizza Hut, Burger King, Gambrinus, Whopper Bar, La Moraga airport, Sea Food. Cafes: Starbucks, Café & Té, Häagen-Dazs, Caffè Ritazza, etc. You can enter the following link to know more about each parking areas of the airport. 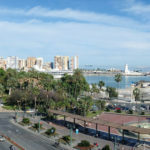 In this respect, the airport works great hosting different means of transportation and the Renfe suburban train linking Malaga and Fuengirola, passing through other popular resorts such as Benalmadena and Torremolinos. There are also several bus lines to reach the most popular destinations on the Costa del Sol. There is a large fleet of taxis waiting outside, and there is also available a wide range of more personalized transportation; these are transfers from Malaga airport or car hire. 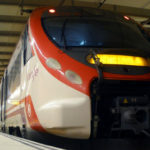 It is the perfect and more personalized transportation to reach your hotel or destination in the province of Malaga. 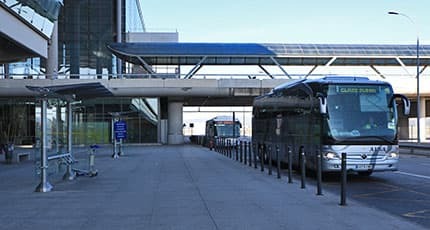 Transfers do have many advantages over other means of transport such as bus or train which will never leave you in the exact place nor will you have a driver waiting for the arrival of your flight to take your bags and provide you a comfortable, friendly and secure journey in a first class vehicle. The driver, who will speak English and Spanish fluently, will bring you to the very gates of the hotel, golf course or any destination you choose and can even advise you about other destinations on the Costa del Sol; not even a conventional taxis can provide such a distinguished and professional service as transfers from Malaga airport, besides there are hardly any price differences between the two services. You can also access the photo gallery of Malaga airport. Phone Numbers: (+34) 902 404 704 / (+34) 91 321 10 00.